The deep base allows your pets plenty of space digging when you fill it with either sand or litter. Pets are easily accessible using the large front door. The set includes wire mesh bridge, ladder, 150ml water bottle, food bowl, 2 x plastic tunnels, snack nibble log and fruit salad food. Bonus eBook ‘PET GUIDE BY SAMS E STORE’ included. This small pet XL starter cage is ideal for hamster, mice, gerbils etc The deep base allows your pets plenty of space digging when you fill it with either sand or litter. Pets are easily accessible using the large front door. The wire mesh bridge and ladder will encourage your pets to climb. The set includes wire mesh bridge, ladder, 150ml water bottle, food bowl, 2 x plastic tunnels, snack nibble log and fruit salad food. Dimensions; (W) 70cm x (D) 37cm x (H) 56cm. Bonus eBook ‘PET GUIDE BY SAMS E STORE’ will be sent to you via Amazon messages in download form, once your order has been processed. 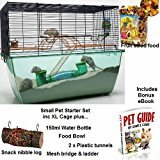 This entry was posted in Small Animals and tagged Bottle, Bowl, Cage, Food, gerbils, hamsters, mice, Plastic, Small, Snack, Starter, Suitable, Tunnels, Water by One Boutique. Bookmark the permalink.